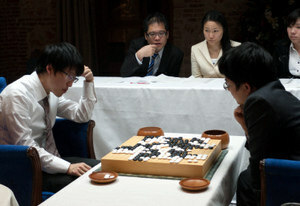 Iyama Yuta 9P (left) defeated Yamashita Keigo 9P by half a point in the first game of the 38th Kisei title match, which was hosted in Alcalá de Henares by the Nam Ban Madrid Go Club on January 11-12, in accordance with the tradition that this title’s first game is played outside Japan. In the postgame analysis, Yamashiro Hiroshi 9p (Referee and Vice President of the Nihon Ki-in), Osawa Narumi 4P (game recorder) and Makihata Taeko 3p (game recorder) watched. Update (1/13): the game record has been added; click on “first game” above.